The sun is low as the dive boat hums along toward our destination. The divers -- mostly grown men -- are like schoolgirls giddy with excitement as the opportunity in front of us doesn’t present itself as often as we would like. The Captain slows the boat and we know we have finally reached our dive site. Hearts beat faster and anticipation mounts as we finish suiting up and complete our gear checks. We try to be patient as the excitement builds and we hear those magic words “Dive, Dive, Dive!”. We move in orderly fashion to the platform, take that giant stride, hit the water, and....blackness. Before learning to dive all of those years ago, I was afraid of the water. Back then the prospect of jumping into blackness with only a flashlight was as foreign to me as being on the moon with a flashlight -- meaning neither of them would happen. Some dive buddy of mine wagered a non-diving related bet and if I lost I had to -- you guessed it -- do my first night dive. The diving Gods laughed as I lost. It was dusk dive, so when we started it was relatively light and once in the water I could still see the reef, the fish, and other divers. I was both excited and apprehensive because I knew at some point the reef, the fish, and the other divers would disappear as the ocean turned black in darkness. 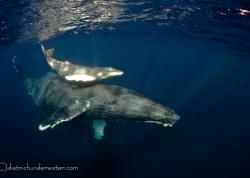 A funny thing happened as dusk made the transition to night and the daytime sea life turned in for the evening. 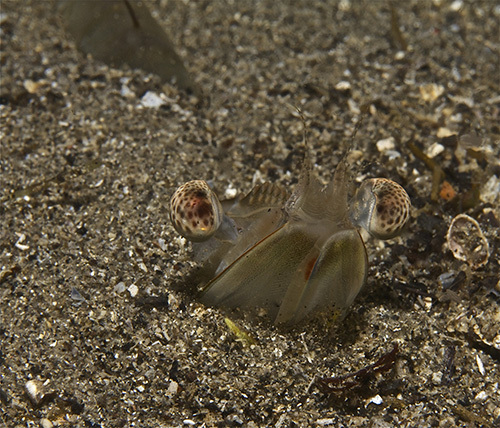 I calmly clicked on my light, taking care not to point it toward my dive buddy’s eyes as he had repeatedly instructed, and watched the show begin. I wanted to scream “Hey, there’s a squid!” and “Hey, there’s a lobster RIGHT THERE!”. I couldn’t scream, but in those moments, I was hooked. I’ve come a long way since that first experience: I became an instructor, logged thousands of dives, and have been lucky enough to venture into the wonderful world of underwater photography. When discussing night diving, I always remind students that safety has to be the number one priority. Know your gear by heart, have functioning primary and backup lights, know how to communicate properly with your dive buddy via light and hand signals, and ensure you are a confident diver able to maintain good buoyancy and air control. Underwater photography is a great way to capture your night dive memories forever, but there are a few differences from taking underwater photos during the day. Your camera's on-board flash generally isn’t strong enough to cut through black water and expose the vivid colors that live in the night sea, unless your macro subject is right in front of the lens. Because of this, an external strobe is essential. 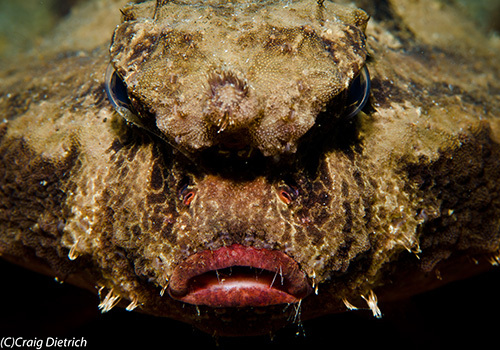 A focus light is also an important multifunctional tool: it gives the camera the necessary contrast to focus on the subject and also serves as the diver’s primary light. Personally, I used the Sola 1200, which is a good light for its size, power, and angle of coverage. Important note: Don’t be concerned about the focus light appearing in your image or affecting exposure. The focus light creates ambient light which is cancelled out by a fast shutter speed. The strobes will create the lighting seen in the image. 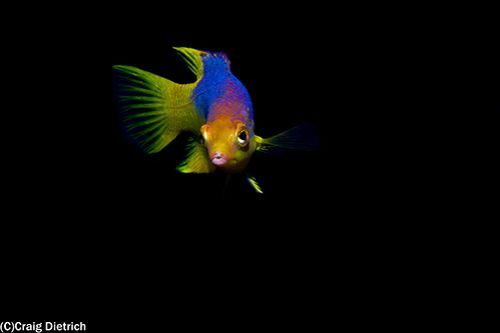 Colorful fish really "pop" against a black background. As with daytime fish shots, wait for the right composition, preferably with eye contact. As an underwater photographer, night diving is like the proverbial box of chocolates -- that’s right, you never know what you’re going to get. It never ceases to amaze me that I can dive a site during the day and be astonished by the marinelife, then visit the same site after sundown and be welcomed by completely different life working the night shift. Eels, octopus, and lobster are at home and seem less phased by divers. Fish are drawn to the primary/focus light and seem almost cooperative as I strive to get that perfect shot. 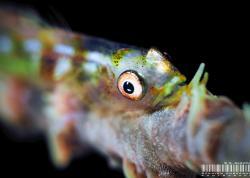 Many marine creatures will even use your light to hunt, surprising their prey as soon as the beam exposes them. An octopus patrols the nighttime reef. 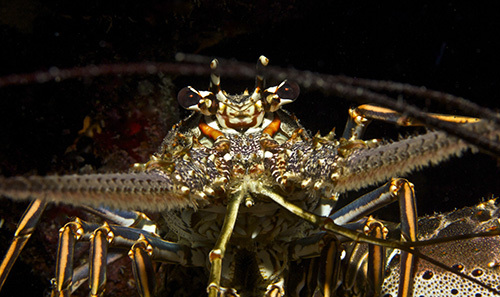 Lobsters are often seen roaming the reef at night, especially during the mating season. 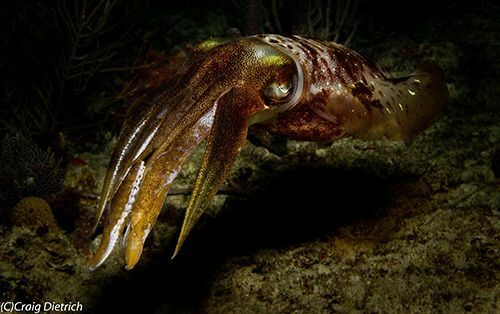 Squid are noctural and attracted to light underwater. It pays be be ready for surprise visits, as these often present amazing photo opportunities. Whether shooting wide angle or macro, you’ll need to be up close and personal with any subject you want to capture, since strobe light will only reach a short distance (this is the same as in daytime). The difference is that photo backgrounds will always be black as long as there's open water behind your subject. We get close in order to fill the frame and to help eliminate backscatter. This can be a little daunting at times, especially if you are shooting something like sharks. If you keep your wits about you, the end product will be worth the apprehension. 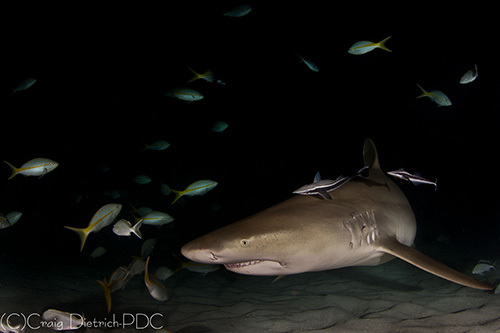 Sharks can be a bit intimidating, especially at night, but it pays to get close and take advantage of the dark water. 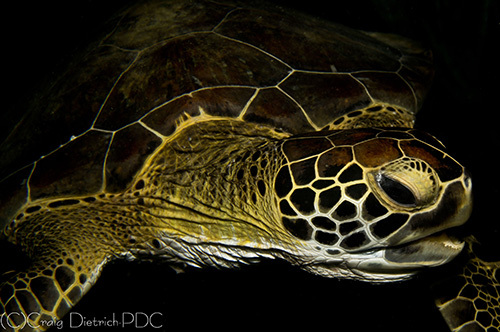 The patterns on this turtle create an interesting nighttime image when shot close to the subject. 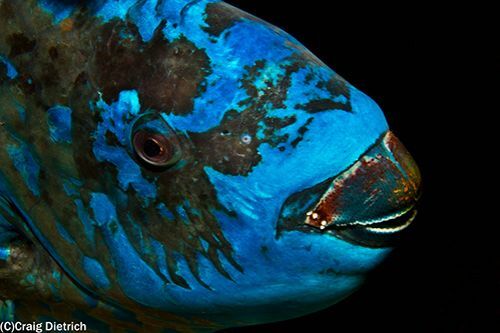 Parrotfish are very colorful subjects at night, however make sure not to disturb them if sleeping (most often in their mucus cocoon). Positioning strobes to create dark shaddows at night creates very edgy portraits. Whether the planned night dive is a wreck or a reef, I always create a dive plan with my dive buddy in advance before entering the water. 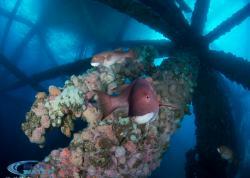 We often try not to stick to the deck of a wreck or the top of the reef, but instead explore the areas nearby. Some of the most intriguing creatures are found in unexpected places, like the sand a few feet off a wreck and the lowest ledges or dark holes on the reef. Check out some nudibranchs many don't realize are right next to their favorite reefs. So maklook where nobody else is looking! 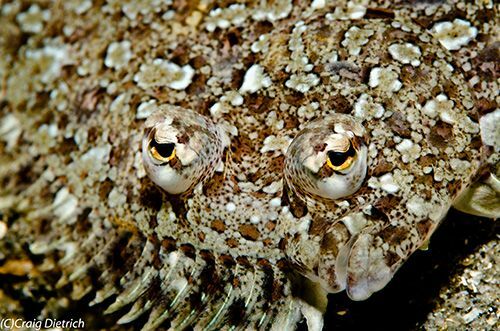 Flatfish are often found in the sand next to reefs & wrecks. 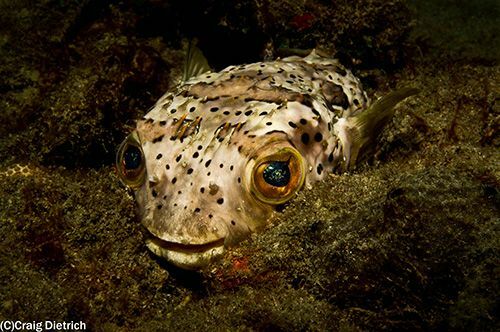 Many new faces pop out of the sand at night to greet divers exploring off the beaten path. 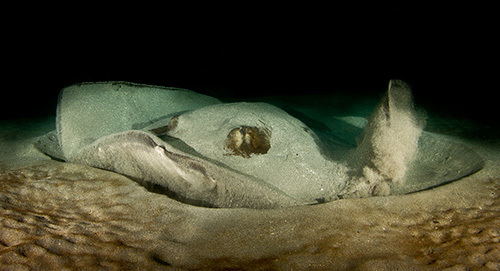 This bat ray was camouflaged in the sand next to a popular night dive site. To many divers, the idea of plunging into dark water isn’t very appealing. Throw in a bulky, expensive camera rig and it can even be intimidating. That said, ask any experienced diver about night diving and you'll find that many prefer it to daytime diving. 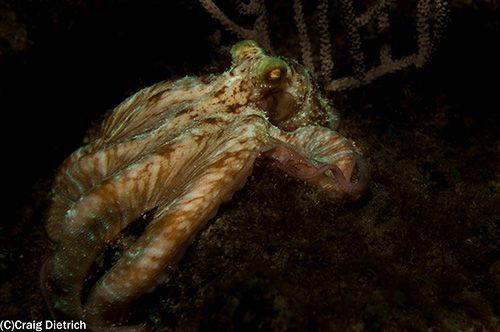 If you were drawn to scuba diving for the sense of adventure, don’t let the things that go bump in the night keep you away from this wondrous experience. 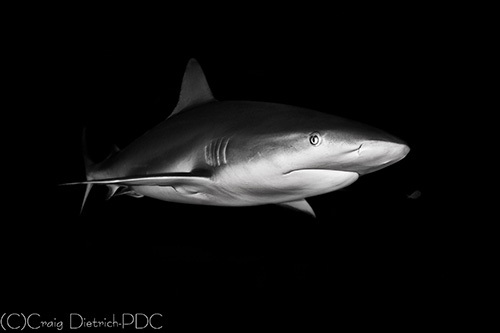 Know that as soon as you're comfortable diving at night you'll be bringing home unique photos. 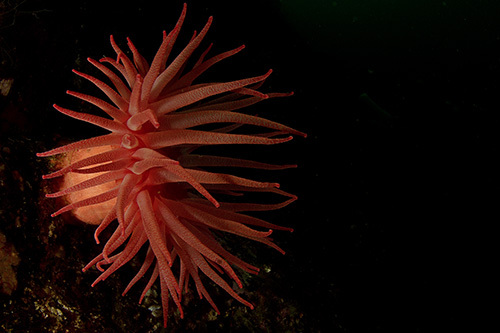 As soon as you're comfortable diving at night you'll be bringing home unique images.